chopped apple salad + pomegranate vinaigrette. …dedicated to all of us who desperately need to recover from Halloween candy overindulgence. Salads, when you make them for yourself, often feel as though they’re just not as good as if someone had made it for you. And by “someone,” I mean a restaurant. You go out and order a salad: it’s lovely. You make it yourself and it feels vaguely like you cleaned out your fridge. I want a bona fide, “I’m out to lunch/dinner” salad but without having to go out to get it. Attention: this is that salad. I did not expect the first recipe I would make out of the new Bobby Flay Bar Americain cookbook to be a salad. I am probably wrong in boiling Bobby Flay down to grilling and southwestern ingredients, and it’s my own fault. I pigeonhole him. It’s not out of disrespect, either. I think he’s a fantastic chef. I tend to gravitate towards different things. He’s been on The Today Show in recent weeks creating recipes from this new cookbook, and I was liking every single one of them. I need more options in terms of meal ideas, and options abound in this book. In short, I am impressed at both the variety of recipes and the ease at which they come together. I am now on my fourth recipe from this book, and I’ve loved everything I’ve made so far. As for this salad, I think it speaks for itself. It was almost no effort throwing it together. 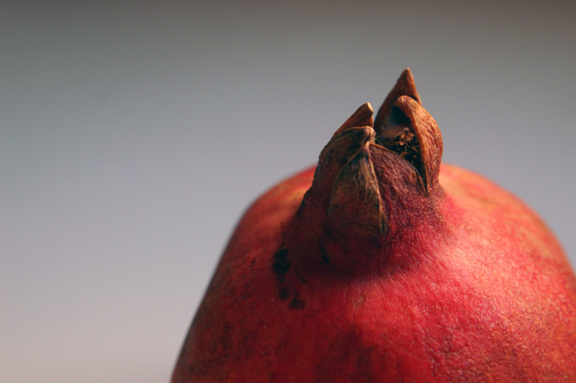 You rough chop most of it, you dice apples, crumble your blue cheese and sprinkle your pomegranate seeds. Done. It’s as worth it to make for yourself as it is to make for a dinner party, and it’s equally at home in both settings. One thing to note: I made my pomegranate molasses because I didn’t feel like searching for it. It’s easy to make if you can’t find it while shopping. I’ve included the recipe it below. Adapted from Bobby Flay’s Bar Americain Cookbook by, as the title suggests, Bobby Flay. 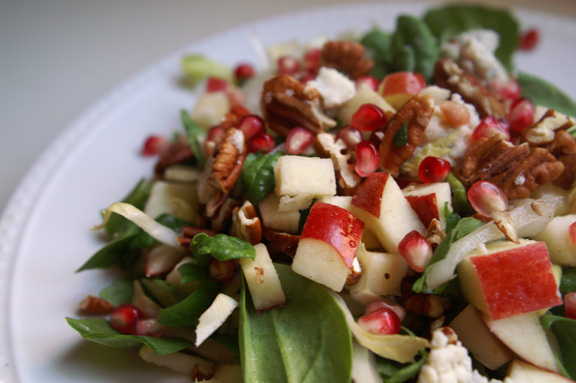 Easy stuff here: combine the apples, spinach, endive, pecans, and blue cheese in a large bowl. Add the vinaigrette and toss to coat just before serving. Season with salt and pepper to taste. Sprinkle pomegranate seeds over top. *Note: to toast pecans, either spread them out on a sheet pan and toast in a 350˚F oven for about 5 minutes, or just throw them in a dry skillet and flip them around a bit for about 5 minutes. when I start to smell them, I know they’re done. Be careful not to overdo them, or they will be inedible: burned nuts are sad nuts. combine in a small saucepan and bring to a simmer. reduce for about an hour, checking every so often to see how it’s going. done. Whisk together the pomegranate molasses, vinegar, mustard, and honey in a medium bowl. Slowly stream the olive oil into the bowl, whisking constantly, until the olive oil emulsifies. Season with salt and pepper. 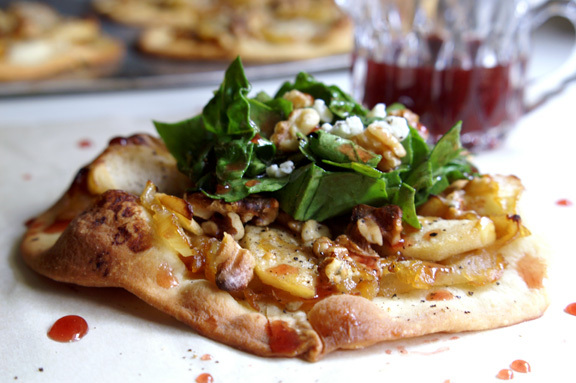 farmers’ market monday: caramelized onion + apple pizza salad. 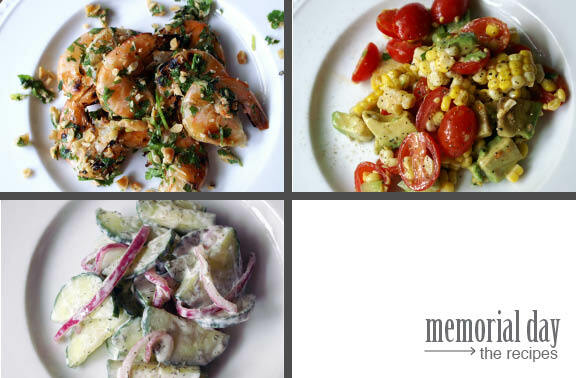 memorial day, part two: the recipes. 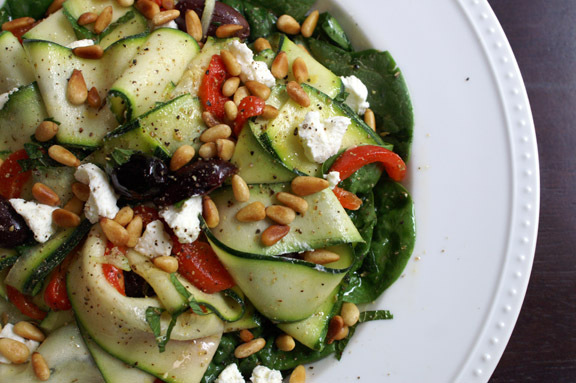 farmers’ market monday: greek-inspired zucchini ribbon salad. birthday cake (aka the sunday night cake).